With fader controllers, you often have a choice of buying something dedicated to one software package, or a generic unit that gives versatility at the cost of tight integration. 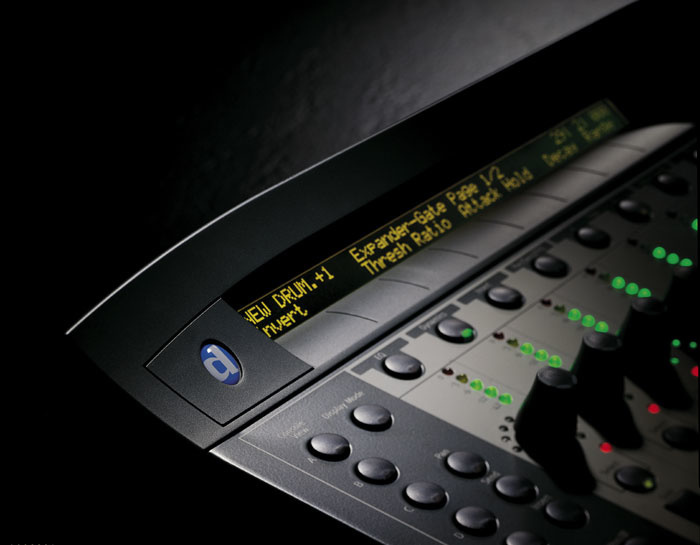 Digidesign's Command 8 aims to offer the best of both worlds. Digidesign already offer a rackmounting variant on their Digi 002 interface, which offers the Pro Tools LE audio interface component without the control surface, and at first glance, their Command 8 appears to be the reverse: the control-surface element of the Digi 002 without the audio interface. However, while the Command 8 is indeed similar to the 002's controller, the comparison doesn't do justice to the new unit's scope. Command 8 provides hands-on control of both Pro Tools LE and TDM software, with the same high level of integration and sophistication that we've come to expect since Pro Control, Control 24 and HUI. A significant departure for Digidesign, moreover, is that Command 8 is not just for Pro Tools: it also runs stand-alone as a MIDI controller for any other capable software. The first thing that struck me about the Command 8 was that it's much bigger than I'd expected. From the pictures on Digi's web site I thought it would be small, light and, dare I say it, plasticky, but in fact it's a hefty and impressive piece of kit. This impression is reinforced by the way that the power supply screws securely into place, a simple but reassuring touch. Despite the obvious similarities with the 002, the design of the housing is better, moving from the other surface's slightly toylike 'scooped' appearance to something more traditional. So, initial impressions are mostly good, and here's a sneak preview: I'm going to say a lot of good things about the Command 8, and it's one of the best all-round controllers I've used. That said, let's deal with my biggest criticism up front! The fader caps are weird, looking and feeling a bit like squashed beer-bottle tops. Maybe they're supposed to be quirky and different, but while their visual appeal is a matter of opinion, they fall short on a practical level. The main problem is that your fingers tend to slip off them, and you have to resort to holding them between finger and thumb, making it fiddly, and hard to control several faders at once. I know Digi are keen to maintain the status of their high-end controllers, but I don't think it would hurt for them to use the same caps as they do in their Pro Control and do justice to the rest of the unit. Anyway, the good news is that the fader caps are attached by standard metal slots so they are easy to replace. I checked with Digidesign whether you could in fact buy Pro Control fader caps, but they won't sell them to you unless you have a Pro Control. Ultimately, though, you shouldn't be too put off by this aspect of the unit, as operationally it's a professional and classy surface. All Command 8's communication with the computer is via a USB connection (another contrast with the Firewire-based 002). Additionally, there are two standard five-pin MIDI output ports, and one input. 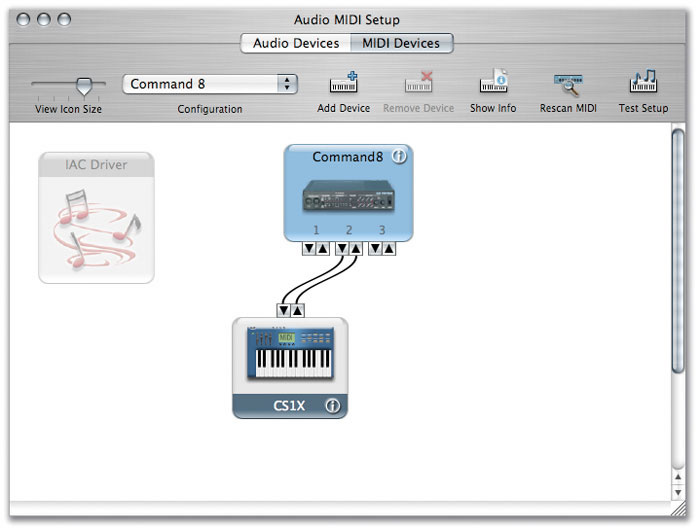 As well as enabling use of the controller in a hardware-only scenario, these connections turn the Command 8 into a general-purpose MIDI interface. During testing, I hooked up my main keyboard via the MIDI input, and declared it in OS X's Audio MIDI Setup window. This worked without a hitch, and proved a really useful addition given that I always seem to be short by one USB port. In Pro Tools, the only setup procedure required is to inform the system of the Command 8's presence via the MIDI Controller page of Peripherals Setup. Surprisingly, you can't use more than one unit at a time in Pro Tools; in fact you can't use any other MIDI controller alongside Command 8. However, you can attach a Command 8 in addition to a Pro Control, Control 24 or Digi 002 and use it for extra faders. One interesting suggested use for this is to have a unit in your live room to provide remote control over transport and monitoring levels. The Command 8 includes audio inputs and speaker outputs, allowing it to be used as a monitor controller. As well as MIDI connections, the rear panel sports a number of quarter-inch audio sockets. These do not constitute an audio interface for the computer; you still need separate audio hardware. Instead they are simply the connections for a built-in monitoring router, which can take two stereo feeds (usually your main mix and some other source). This then gives you control of main speaker and headphone monitoring levels from the Command 8's front panel. The eight full-length faders are touch-sensitive and motorised, staying locked to the parameters they are controlling, and jumping to new positions if you switch them to address a new bank of on-screen controls. High-resolution encoding gives 1024 values, instead of the usual 128 steps you get with MIDI Continuous Controller messages. The fader tracks are marked with a dB scale, which is calibrated to reflect the brand-new feature in Pro Tools 6.4 where faders have +12dB gain above unity. This must have been a difficult decision to make, as it means that the scale is wrong for all Pro Tools Sessions that opt for the +6dB fader preference. It also means you need to ignore the scale for other software, such as Reason, where the unity points don't line up. Each channel strip has a single rotary encoder, which in Pro Tools is used to control pans, send levels and plug-in parameters. As in other Digidesign controllers, buttons down the left side of the front panel are used to select the active function for the pots. A ring of 11 LEDs around each encoder provides visual indication of the current value. Cleverly, depending on the nature of the parameter being controlled, the display is either a single LED that shows which way the pot is 'pointing', or a continuous row of lamps lit up to the current value. The pots are arguably a bit too big, which brings them close together and makes it easy to move adjacent knobs by accident. My other minor criticism is that when a LED is lit, its near neighbours tend to catch some of the light from underneath the panel, making the reading a little ambiguous unless viewed from directly above. Otherwise, the pots are one of the strongest features of the Command 8. 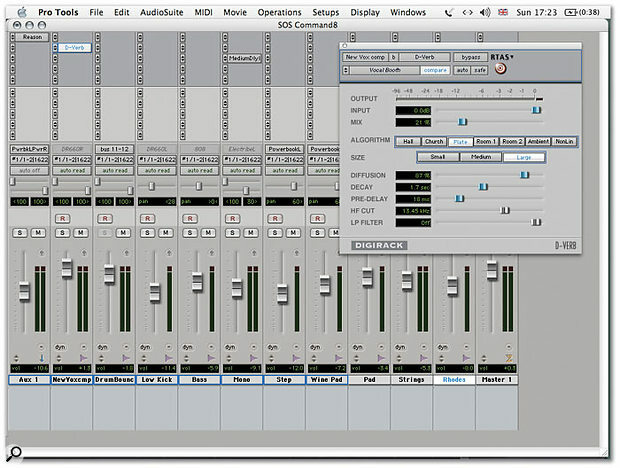 For Pro Tools, they have very reliable and smooth tracking with the on-screen parameter they are controlling. They are, in fact, noticeably better in this regard than the pots on the vastly more expensive Pro Control, which sometimes suffer from poor tracking of plug-in parameters. The best thing about the pots is that they are true continuous encoders, which means that with supporting software they just pick up from the current value of the control they are addressing, without the parameter jumping to match the hardware's absolute position. With Pro Tools, the Command 8's pots always work in this 'increment/decrement' fashion, but other software can handle it too. I was particularly excited about how well this worked with Ableton Live. The advantage of this system is particularly prominent in a live situation, where you don't want to have sudden jumps, especially when mapping something like Live 's tempo knob to one of Command 8's encoders. What's more, the pots are velocity-sensitive, so if you twist an encoder faster, its corresponding parameter will move further for a given angle of movement. Sticking with the channel strips, there are three buttons above each fader, labelled as Mute, Solo and Select. In Pro Tools, they do what they say, with the Select buttons used both for track selection and for choosing options from menus in the display. The bright-orange LCD display has two rows of six characters per channel strip. During normal operation with Pro Tools, the displays show abbreviated track names, flipping to show parameter values whenever a control is moved. Command 8 shares this handy feature (which is lacking on Pro Control) with Digi's new super-high-end Icon mix surface. The two-line LED display gives feedback on the parameters being adjusted by Command 8 controls. Directly below the display strip is a row of eight buttons, which in Pro Tools mode are not part of the channels. Instead the buttons here are used for focusing in on plug-ins and sends, reassigning the eight rotary encoders to edit those values. For example, if you press the EQ button, the display will highlight which tracks contain EQ plug-ins. Hitting Select on one of these channels will focus in on the EQ for that track, and map parameters to the knobs and Select buttons. Where a plug-in has more than eight knobs and switches, they are divided into 'pages' that are accessed from the Page Up/Down switches. As on Pro Control, a Flip button lets you switch things round so that plug-in parameters or send levels are controlled by the faders. This is very useful when recording changes in automation, as the knobs are not touch-sensitive. A nice side-effect of the lack of a separate plug-in control section is that when a plug-in is assigned to the encoders, the Flip button automatically switches to fader control, whereas on Pro Control you have to hold down Command as well or you always get send levels. Another neat feature is the Pan/Pre/Send button that lets you control all the panning, send levels, and pre/post settings at once for a particular channel. Command 8 uses Pro Tools' built-in controller 'banking' system for accessing more parameters than you have physical controllers for. The left and right buttons from the circular section on the right of the panel shuffle which eight tracks are being addressed by the surface. The Bank and Nudge buttons choose whether the faders are moved in banks of eight, or one channel at a time. An example of the level of integration you get with Pro Tools, compared to generic MIDI controllers, is that the cursors also have a zoom mode for use in the Edit Window. In fact, most of the switches on the right-hand side are dedicated to specific Pro Tools functions, such as window selection, Master fader display, and playback and record modes. Extra MIDI ports, seen here in OS X's Audio MIDI Setup utility, mean the Command 8 can be used as a MIDI interface.Sitting apart from most of the other controls on the right-hand section of the Command 8 is the Standalone button. Pressing this transforms the unit from a dedicated Pro Tools controller into a generic MIDI device. All the faders, rotary encoders and buttons on the channel strips can be programmed to transmit any MIDI Continuous Controller message required, with the exception of the buttons in the top row which have fixed values. This gives you 32 buttons plus the transport, so it's not that disappointing that all the other buttons cannot be used in stand-alone mode. In fact, each Preset (of which you can store eight) actually has two completely independent pages, toggled via the Bank button. All this adds up to 16 faders, 16 pots, and 56 separate buttons per preset, which should cover most situations! The transport buttons are permanently set to transmit standard MIDI Machine Control messages, so can't be used for software that doesn't support MMC. There are no factory presets provided for controlling specific devices, so getting things working can take some time. It's a shame that Digi haven't included a template that emulates the Mackie HUI or Mackie Control for instant control over Cubase or Logic. SysEx saving and loading or presets is supported, though, so hopefully some charitable people will publish some templates soon enough, or maybe Digidesign will provide these as an update. In any case you tend to use the built-in controller learning functionality to set up MIDI control in software like Live and Reason. The templates in memory have default CC assignments for all parameters, so in these applications you can just start assigning controls in the software and leave the hardware alone. Programming controls is actually very easy. All that's required is to press the Edit button, then press, move, or turn the control that you want to edit. The rotary encoders are then used to set the MIDI channel, CC number, and high and low values. Switch behaviour can be set to 'latch' or 'momentary', the former for toggle switches, and the latter for controls that are only active while you are holding them down. 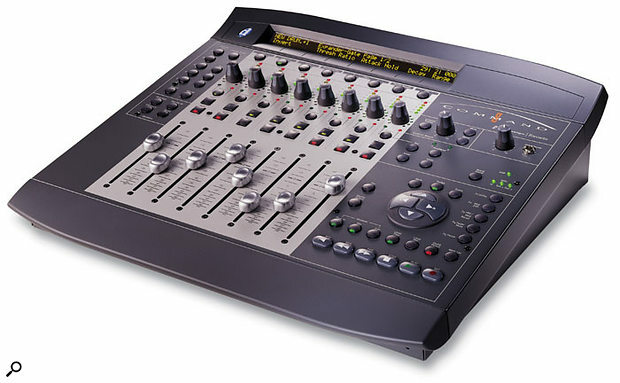 Faders and encoders can operate at single- or double-byte precision. Tracks and plug-in parameters being controlled by Command 8 are highlighted in blue. The channel Bank, and plug-in Page Up/Down buttons switch the assignments in groups of eight. Command 8 worked flawlessly with Reason and Live during my testing period. Live had perfect two-way communication, so the motorised faders followed controls that were moved by the mouse or automation, and the LEDs displayed values correctly. This, combined with Live 's ability to pick up from the directional movement of the rotary encoders, instead of jumping to an absolute value, meant that the hardware and software really were locked together. Reason, being unable to transmit MIDI, and unable to understand continuous rotary encoders, was more primitive, but benefited as much it could from any MIDI controller. One feature that really stands out when running with other software is the ability to switch between Command 8's stand-alone and Pro Tools modes on the fly. This means that if you are running Pro Tools with, say, Live or Reason in Rewire mode, you can control both applications. Switching to stand-alone from Pro Tools worked fine, and I could then control Reason. However, I ran into a problem where switching back — the unit would not re-establish communication with Pro Tools properly, and I had to clear and then reset the Peripherals settings. Luckily, it turns out this problem has been fixed with a firmware upgrade, available as an updater for both Windows and Mac. This dual-operation functionality could be Command 8's greatest appeal to anyone who combines Pro Tools with other MIDI software. Anyone who's used to Pro Control will be able to pick up the Command 8 very quickly, as the functionality within Pro Tools is so similar, and many of the same features are present. This alone should tell you that the unit is good value for money. Obviously, some of the higher-end features are not the same, such as a separate plug-in control section, scrub wheel, or surround monitoring capability. The only things I'd miss day-to-day, though, would be Pro Control's automation enable and auto-suspend buttons — and the faders of course. The Command 8 has a wide-ranging appeal. It's inexpensive enough to appeal to smaller music setups, where it will be great for controlling soft synths, and where the ability to flip between controlling Pro Tools and other software is a real bonus. Project and pro studios can either use it as their main Pro Tools controller, or as a remote control to add extra transport and monitoring control, not to mention MIDI connections. Mobile rigs, or smaller post-production rooms will also be a natural niche for the Command 8, especially where a TDM system is preferable to the integrated 002 system. I personally think it would make a great live controller for programs like Live and Reason. The thing that impressed me the most with Command 8 is that the stand-alone MIDI controller mode is not just an add-on or afterthought to the Pro Tools functionality. The unit stands tall alongside other generic controllers and should be on your shortlist, even if you don't use Pro Tools. Full length, touch-sensitive, fast motorised faders with 1024-step resolution. Completely cross-platform controller — not just for Pro Tools. ...but highly integrated if you do use Pro Tools. Fader caps can be replaced! Built-in transport and monitor router makes it ideal as remote control. Banking function in stand-alone mode doubles number of controls addressed by the surface. Fader caps feel a bit cheap and your fingers slip off them. Pots slightly too large, and therefore close together. No ready-made templates for third-party software. Can't use in conjunction with other MIDI controllers in Pro Tools. Pro Tools really comes into its element when used with a dedicated controller, and this is the least expensive Digi controller to date for LE and TDM systems. Despite the low price compared to its bigger brothers, surprisingly little is lost. What's more, Command 8 doubles up as a very fine generic MIDI controller.